Samsung and Google jointly announced the convertible Chromebook OS laptop Samsung Chromebook Plus and Pro at CES last year, and by the looks of it there is a chance that a new Samsung Chromebook might be announced at CES 2018, but either replaced by a detachable 2-in-1 tablet or with such a 2-in-1 joining Samsung’s Chromebook family. The possible leak comes from the Chrome OS followers at Chrome Unboxed who drew the conclusions about Samsung project Nautilus after they dug up information from Sony about the camera on board of the tablet, which they believe is a 13MP Sony Exmor RS camera. That would be a step up on the camera front for Chromebooks, but we should remember that Samsung’s Chromebooks already feature Intel Core processors, integrated S Pen, and 2400 x 1600 resolution, so it’s only natural that Chromebooks evolve with higher specs considering the market share they have by now. Another source from October believes that a Google Pixelbook 2-in-1 tablet will launch this year too, powered by Intel Core i5 and i7 processor options. 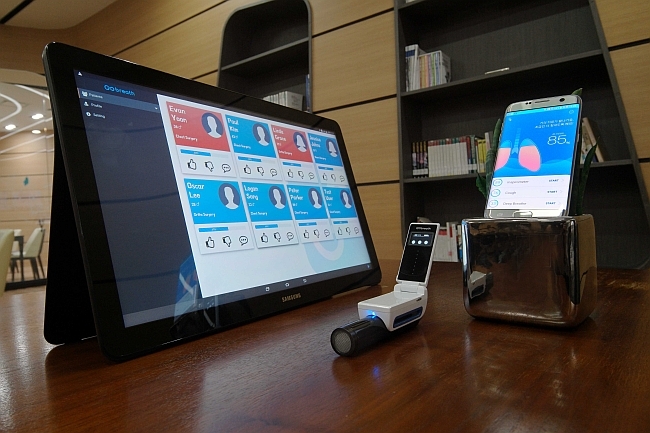 Samsung have teased some of the devices they will unveil at CES, but the closest thing to a tablet so far is the GoBreath device that monitors the breath of people with lung damage and pulmonary complications, where the status results are shown on a tablet or phone, seen here on the large 18.4-inch Samsung Galaxy View.